For some time I have been collecting everything Ultramarines, slowly building my stock until I am ready to begin painting my new 'vanilla' army. I knew when I began collecting that I had to come up with a different style for my ultra-marines. I want them to look as cool as I think they are story-wise. So with drive to start a new army slowly building, I decided to test paint a tank to see if my new recipe for blue would work. 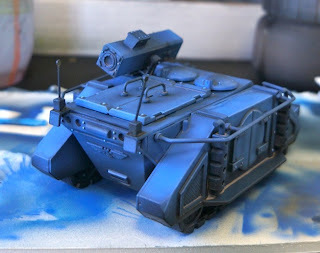 I did not feel like building a tank specifically for the task, so I reached back to one of my original space marine Rhinos, stripped it of paint, and gave it the blue treatment. The Rhino is currently sitting on my desk exactly as it is in the photos. 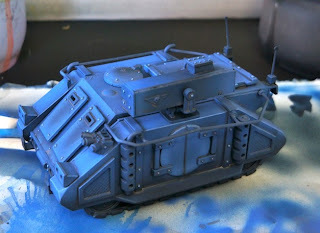 The base coat is done, and a light wash of dev mud has been applied, finishing off the pre-weathered chassis. Two thing stand out when I look at the model. 1. How do people paint ultramarines? I started with a black/enchanted mix followed by enchanted, followed by Ultramarines blue. I think I am close to a recipe that works, but I am just not sure. Maybe a light wash of Badab black at the end? 2. 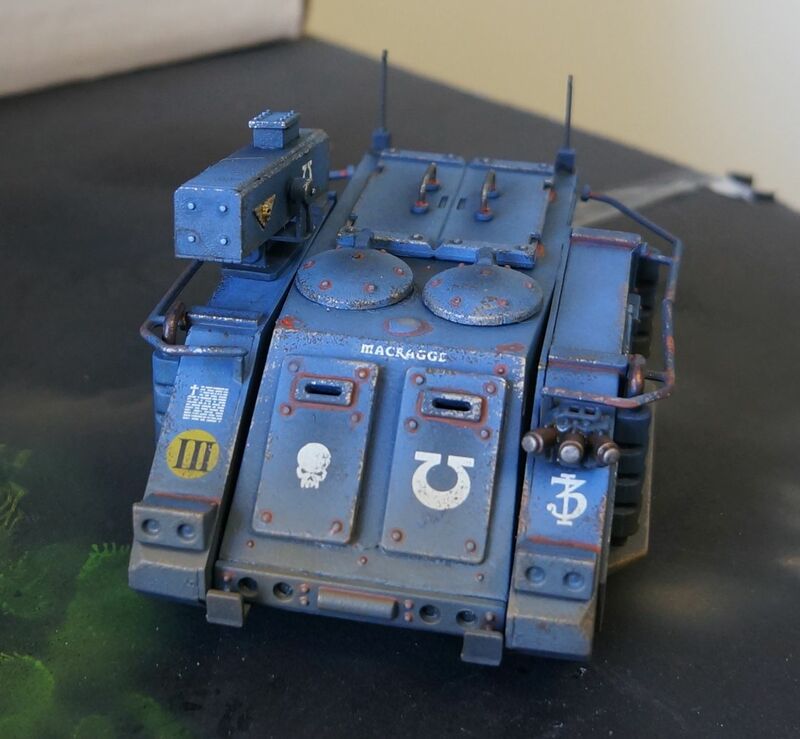 Is it possible that old rhinos can look good again? 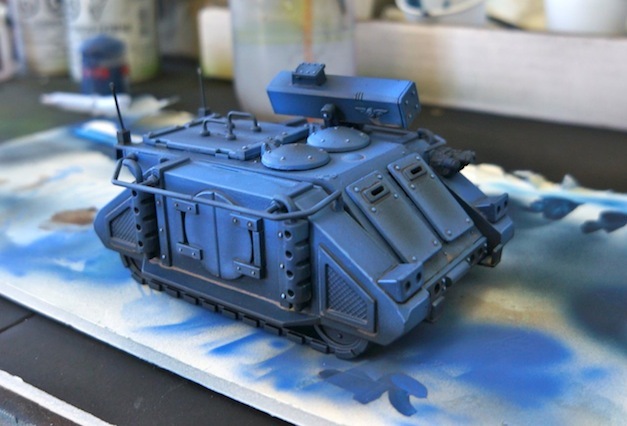 I think regardless of the color decision, I am going to push this Rhino forward. I can always strip the paint away again after the experiment. I have a lot of these rhinos, and could easily field 5-6 of them, so long as a few of them end up as donor chassis for damaged pieces. The real question is whether or not they would look good. 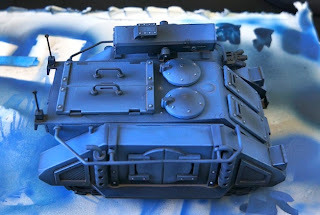 My old tanks have many layers of paint on them. Stripping the paint is almost like a mini-course in archaeology. 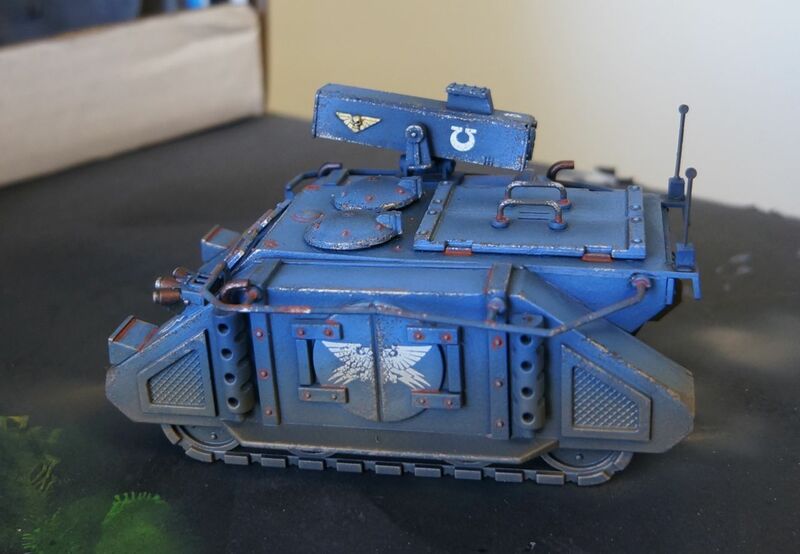 This specific tank was originally purchased to provide transportation for an Imperial Guard platoon, and had IG markings two layers down. In honor of it's previous designation 3rd Rhino F company command, this tank will retain the number three somewhere on it. So what is the verdict? 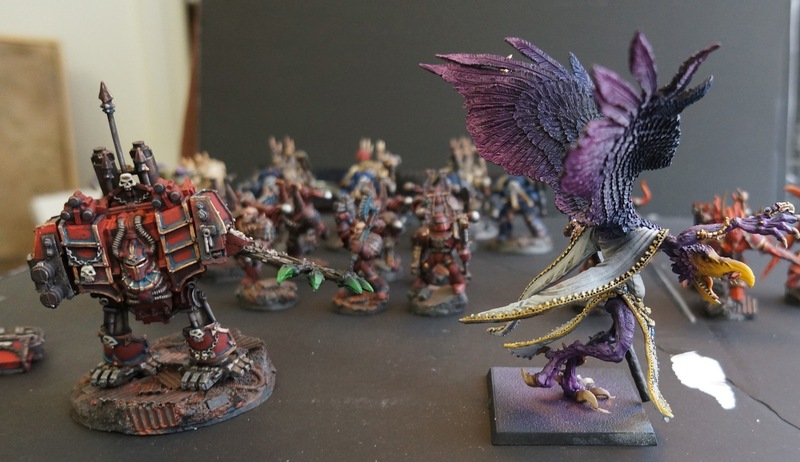 Is miniature restoration worth it from a hobby perspective? 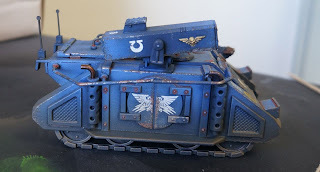 Should I strip all of the old Iron Scythe Space Marine tanks and repurpose them? 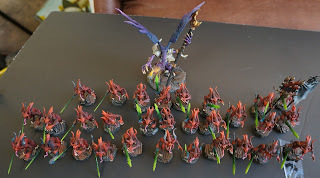 I hated painting the chaos spawn. In every way I feel like I should love the models. There are really hard to paint because there are few distinct details. So how would I fix spawn? 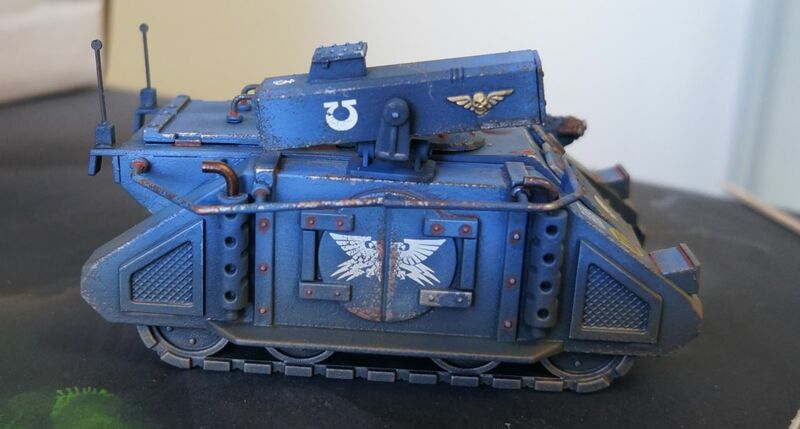 I'd put broken bits of space marine armor all around them, hanging off their tortured frames. 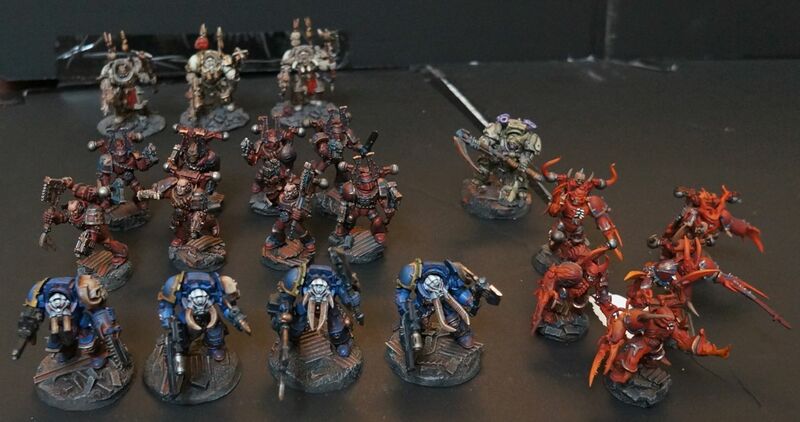 If there were more to distinct areas to paint it would be easier to give the impression that these are space marines who failed the emperor, failed their legions, and then failed their chaos patrons. They are thrice damned! Thrice-baked potato, does that work? Abbadon is one of the original Sons of Horus/ Lunar Wolves, however the highly detailed finecast model just does not match his age or awesomeness. 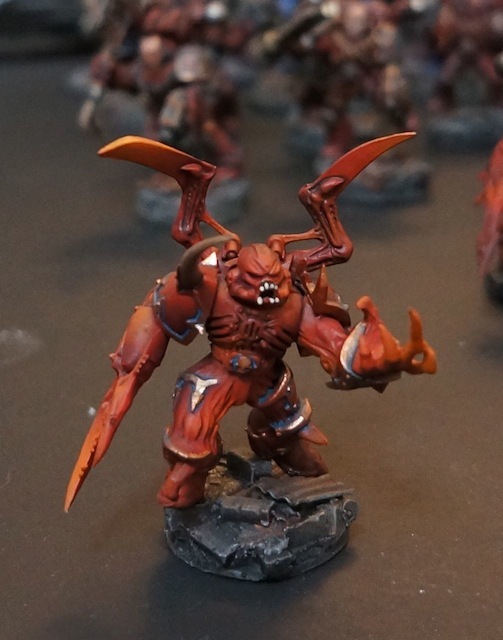 What the fin cast model does provide is an easy to dissect base from which to build a better Abbadon. 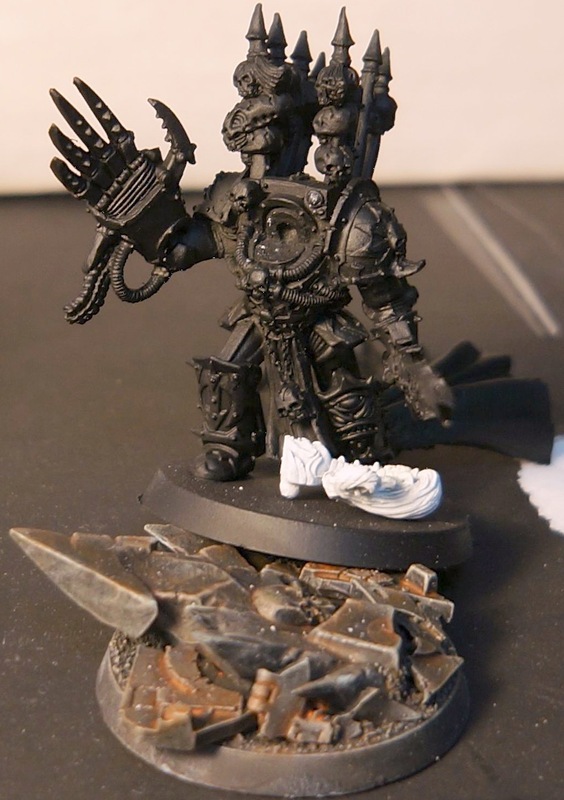 This conversion is not perfect, but the flaws are easily hidden with the terminator chaos lords cloak. Basically I took the shoulders and torso of the finecast model and married it to the plastic chaos terminator lords legs. The goal was to make it look good from the front. The back could be easily hidden with a cloak, which would make the model look more imposing in any case. After the body had its new legs, I used plastic terminator arm pieces to extend the arms holding the weapons. 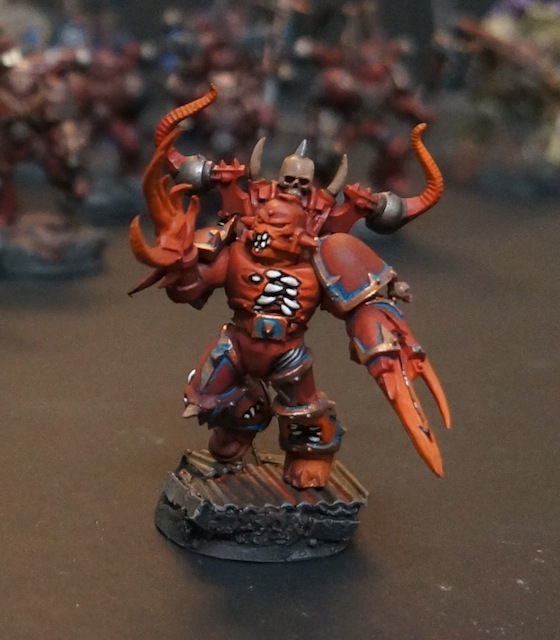 The original Abbadon model has weird stumpy arms, but huge hands. 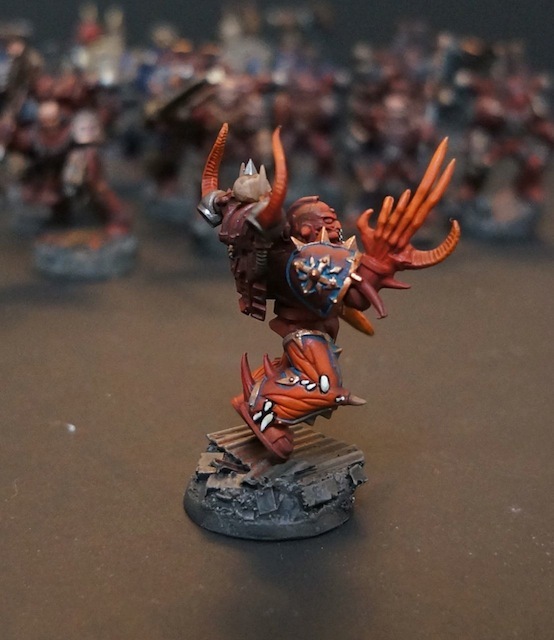 This turns out to be a benefit, because the forearm of the finecast model ends up fitting really well onto the plastic arm extensions. All I need to do now is paint this guy up in black legion colors and give him an honor guard. This is about 1210 points, so I am a little shy of a 1500 point game. 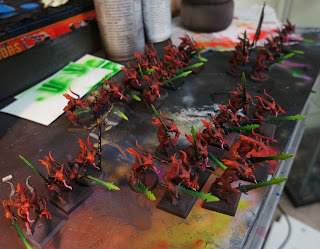 I could paint up another 10 Pink Horrors in addition to the Soul Grinder. Do people play at 1k? Maybe I should just try a small game. Ultimately I just want to see some Daemons on the table. 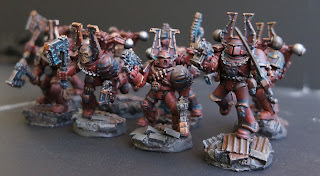 At the bogey man of the 40k universe, I think it would be really cool to see some marines or guard assaulted by daemonic forces. That fits my movie/fluff based vision for what a game should look like. Winning a game played this way does not even matter so long as really cool stuff happens. 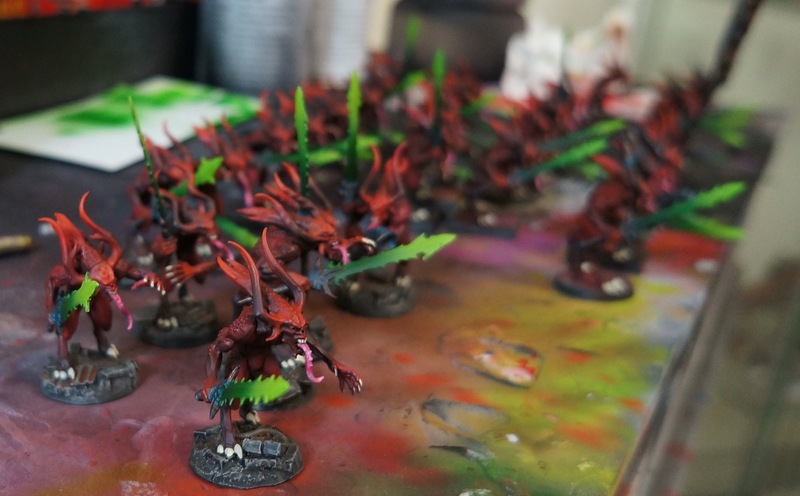 Oh My God, It's Full Of Daemons! The Daemon army progresses! With a major milestone accomplished at work, and Moby songs in my head, I sat down and pushed through all of the tooth/hoof/blade portions of the Bloodletters. I was worried about the green blades, but after getting more of them completed and the first eight based, I am pretty pleased. I don't think I have ever painted this fast. The messy job of casting more bases has started, and I have little doubts that the army will be done by this weekend. 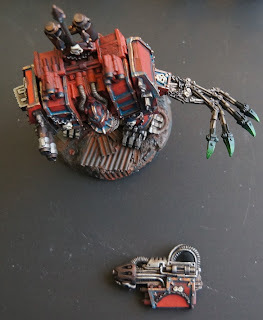 I picked up one of those half robotic spider/ half deamon mutant vehicles things to add to the army, and some older models to rebase, and I think I am good to go. I was supposed to be making a slight diversion into chaos in order to recover from speed painting my minty neurons, but like many slight diversions, it snow balled. 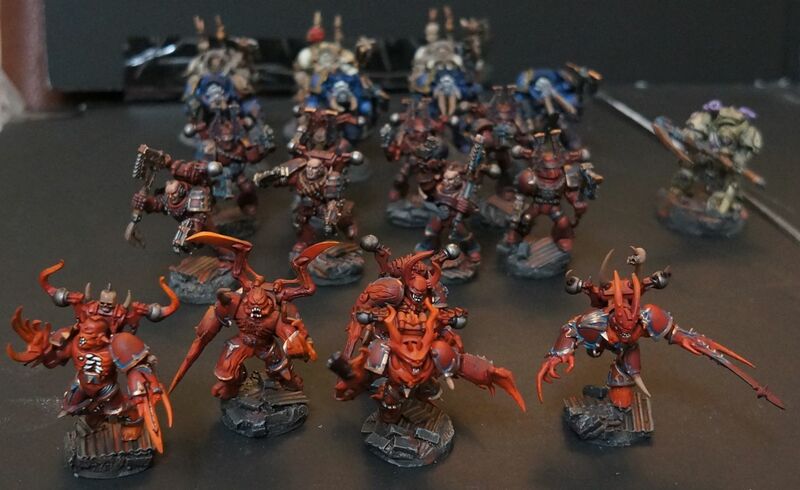 Maybe I'll take a break from my Daemons to paint some squats or something... who knows. 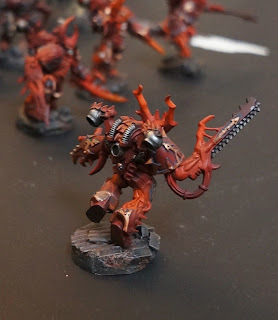 I've had some Bloodletters stowed away for some time, and after reading the Chaos Marines codex, decided to paint them up to use as summoned lessor daemons. 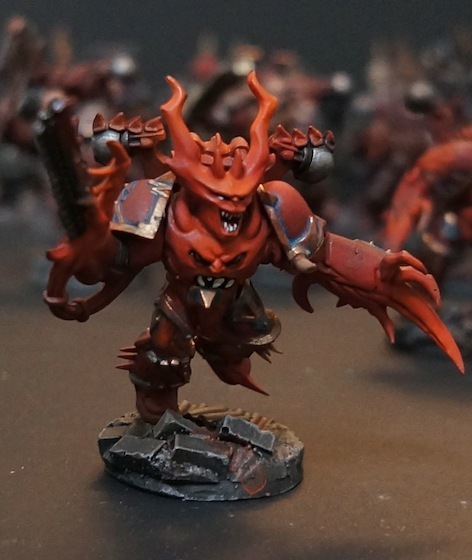 The fact that they can pull dual duty for both the chaos marines and chaos daemons codexes is a bonus. 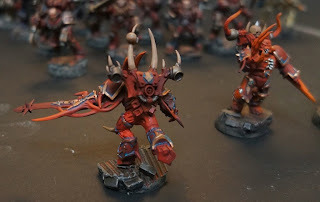 I think I am going to go for an all daemon army as well, just to have something different to throw down. 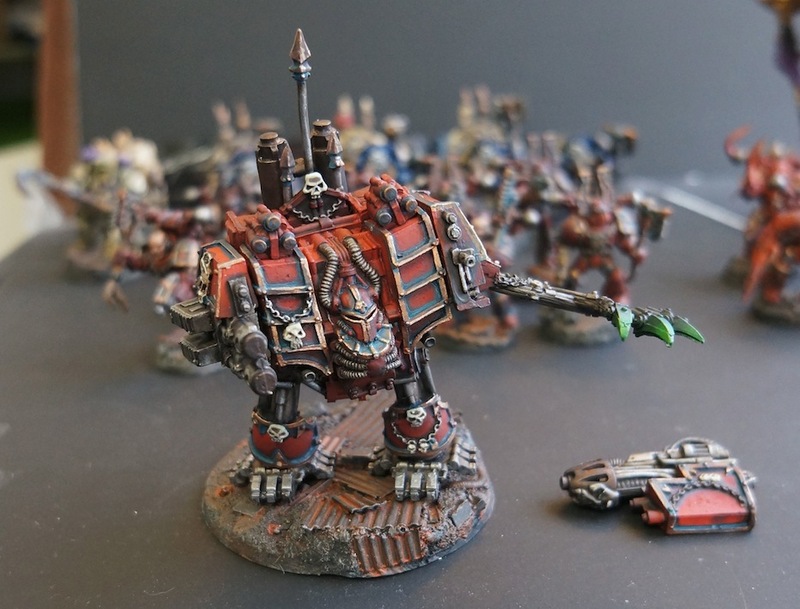 After all, with all those Grey Knights armies around, it only seems right to have some deamons for them to face now and then. No matter how you cut it, painting 30 miniatures is tedious. If I had not had an airbrush I would not have even attempted this. From the photos you can see that the base colors are down, and I am painting up the metallic bits. Each model has around 50 raised bumps, which I will probably have to paint by hand. I plan on painting the nubs white or orange. 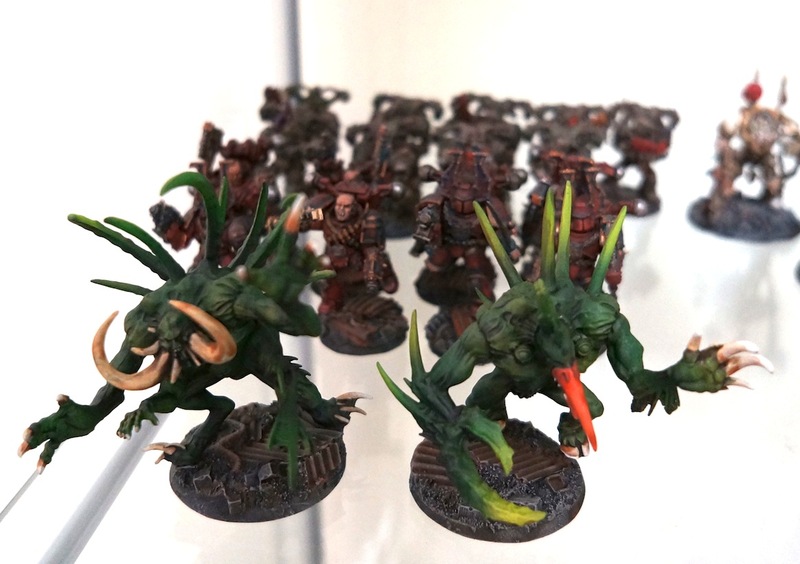 Before that i will need to pour 30 resin bases, so these guys have something to stand on. So with all that work, by Friday these guys should be ready for the table top. Not bad for two troops choices! 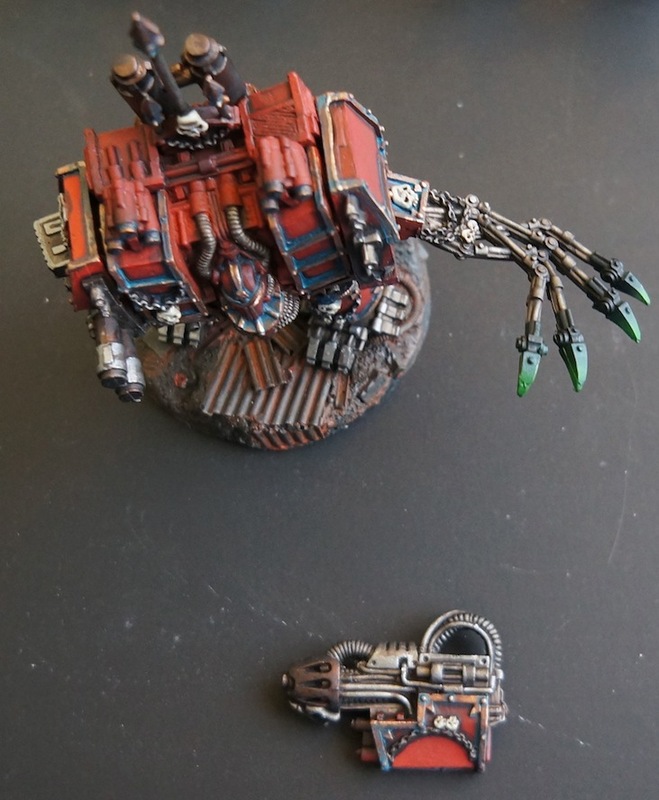 Continuing the speed-painting-a-thon, I decided to paint up a Chaos dreadnought that I nicked off ebay for a steal. 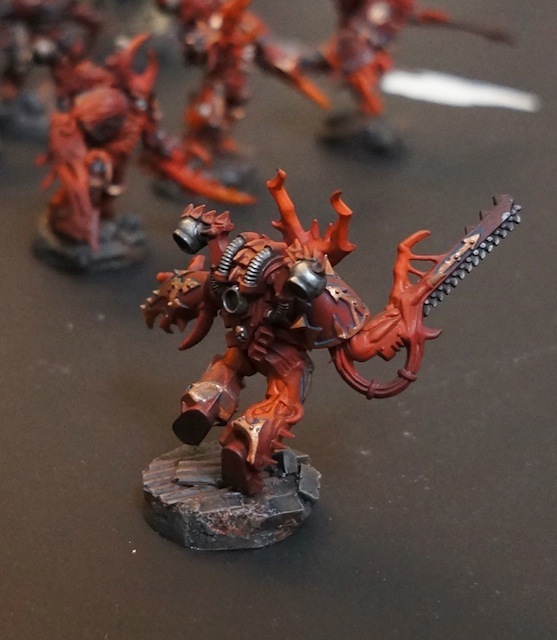 If the price had not been so good I might not have bothered, given how much I dislike metal models. In another transaction I managed to pick up some dreadnought weapons as well. One of the things I like about new models is that edges are crisp, and there is little difficulty in figuring out where to paint. 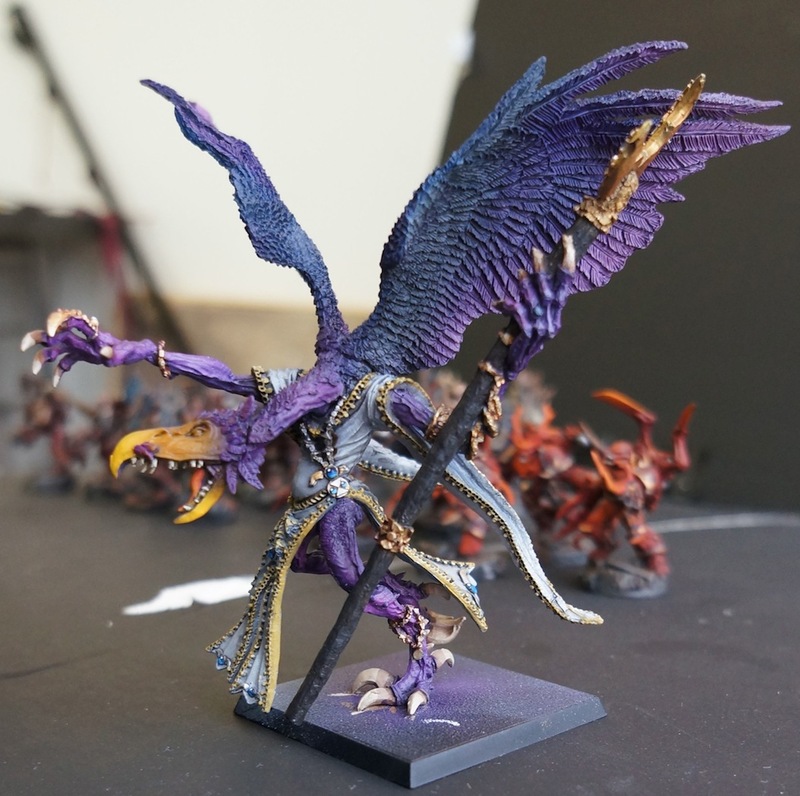 The older models require a measure of looseness in painting style that works great for speed painting, but makes it difficult of me to paint clean models. Despite this, I really enjoyed dousing this old guy in paint. I think he looks great with the army. 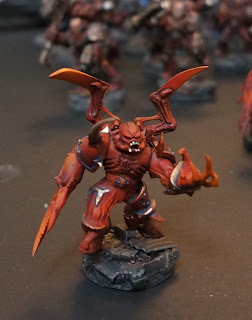 Given my inability to actually finish a model, while painting the dread, I decided to paint up a changer of ways greater daemon as well. 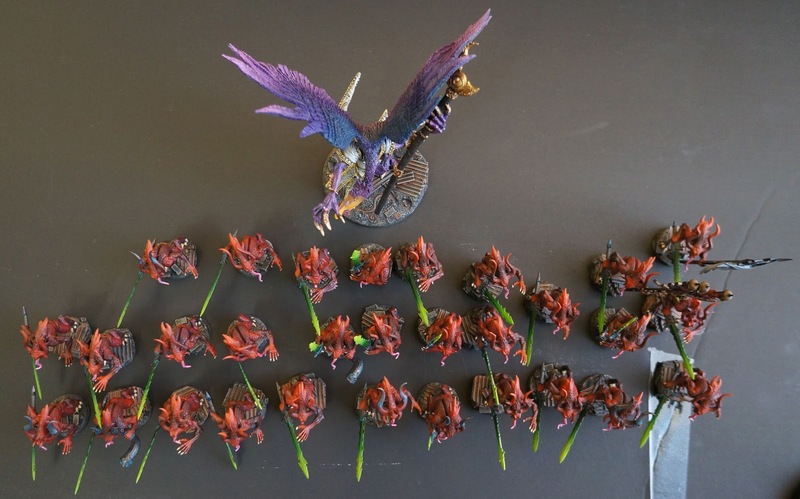 The palette is completely different, and will fit with the all daemon army that I've decided to build to complement the Chaos Marines. I suppose I could magnetize the daemons to their bases, and have square or round bases depending on game system, however I am not sure I want to slow down my painting with all that drilling. My wife loves the Daemon, so I must have done something right! After the fun I had painting the berzerkers, I decided I had to paint up the box of possessed space marines, I've had sitting on my bench for several years as well. 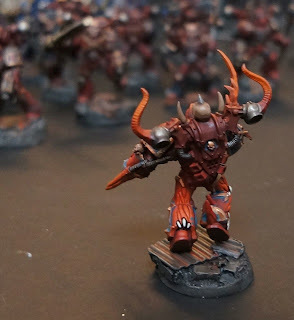 I love the models, however I had a really hard time understanding how the paint them. The fact that the hard sharp armor is melting into daemon form, makes it difficult to paint sections without blending them all together. 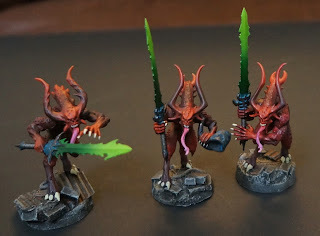 I decided to use my airbrush and paint them as if they were turning into pure daemons. I tried to add just enough areas of hard edges for contract that the minis would be interesting. 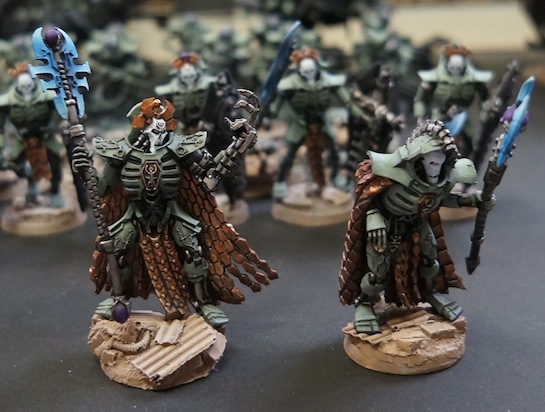 I am not sure if they look like they go with the whole army, but the basing does tie them in a little more. All of the daemons I paint are going to be vivid colors, so there is some rational for it. 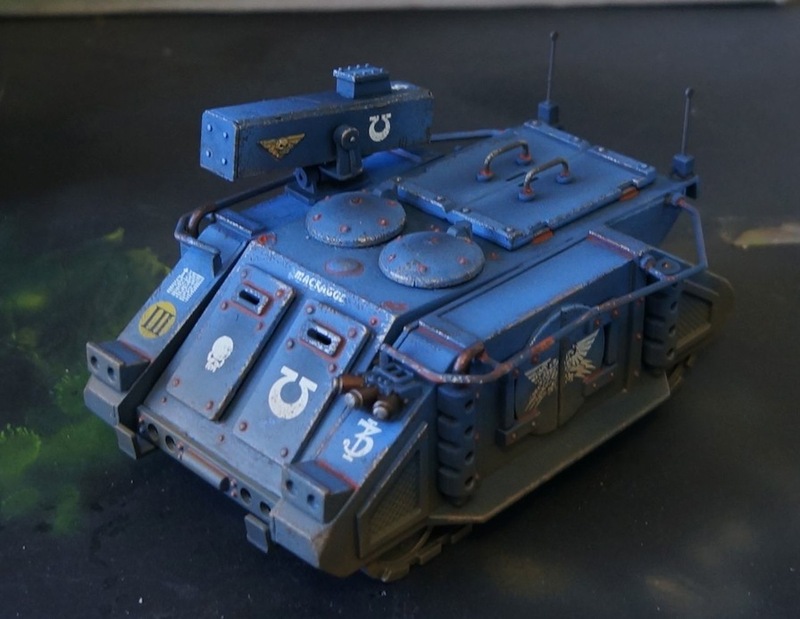 The next thing any Chaos force needs is a unit of turncoat ultramarine terminators. 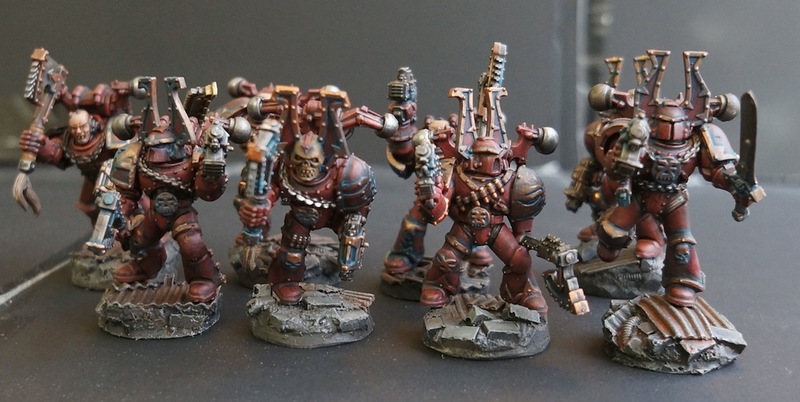 I painted these out to see if I could reproduce the heavily weathered ultra-marine I painted eons ago. I failed. I have no idea what I did wrong, but the mojo was off, and these guys just turned out alright. 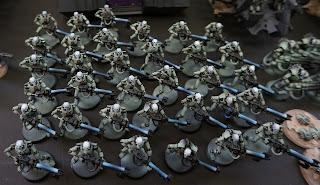 All of this Chaos stuff does not mean that my Necrons are done. I am just taking a break so I can focus on some random colors. This is sort of like a painting interlude! Tournaments should provide players with tournament dice. How many times have you seen players change out their dice when they need a certain roll? Why not just remove any doubt of irregularly by removing it from the game altogether? 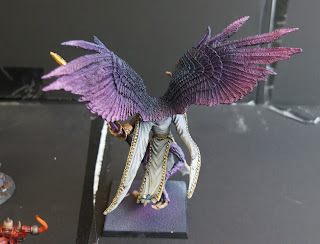 Ok, mini-rant over, back to the regular modeling and painting content. 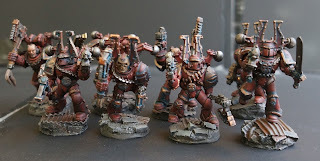 I started painting this squad years ago. In fact, they sat so long that when I decided to paint them I had to wash them under the sink remove years of dust from the partially completed paint jobs. My techniques have changed quite a bit from those used when these guys were started, but I am really pleased with these none the less. 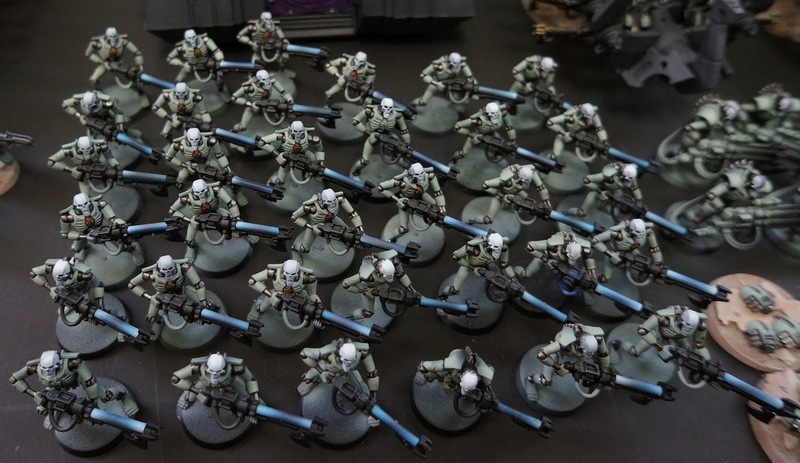 I think I just needed a non-Necron diversion. I wanted to paint a squad start to finish. I wanted to toss these guys on the test bases you see, and just enjoy their ferocity every time I glance at them in the cabinet. I might even paint some more Chaos goodies now. 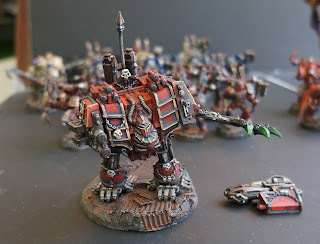 It was so fun just painting something different that I feel like I may need to paint that old Chaos dreadnought I found on ebay. I have no idea how to put together a chaos army, but I think if I just paint what I want, I'll end up with something enjoyable on the table. So I've been bit by the Chaos Marines bug. Does that mean I intend to paint cleanly and carefully? Nope. My plan is to speed...er...even speedier paint a force of these guys. I just want to enjoy loose brush strokes and the freedom of heavy washes, weathering, and verdigris. How long will this chaos spurt last? 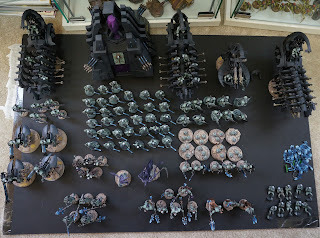 I think just long enough for me to use up all those black rusty test bases I painted up for no apparent reason. I may do something I rarely do, which is go back and take finished older miniatures, and weather them up, rebase them and make them fit in some kind of visually coherent way. I've made a lot of progress on my Mint-crons recently. The Stormlord and Trazyn are complete, as are the death marks, and the Praetorians. 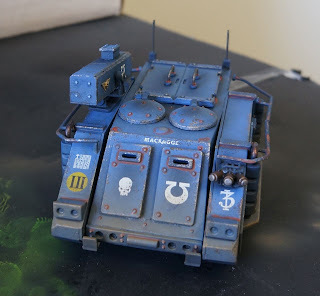 I based both scratch built crypteks, painted another, as well as painted up a Heavy Destroyer I found neglected in the back of an independent hobby shop. 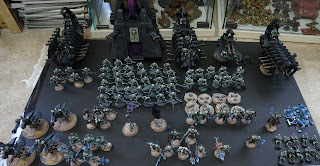 (see there is a reason to go to non-GW stores!) I also managed to paint up 10 more warriors yesturday. Visually the biggest army wide impact have been the blue power tubes attached to the rank and file necron warriors. I have not decided what color to paint the power cables test, but once I do, the last step will be basing all of them. 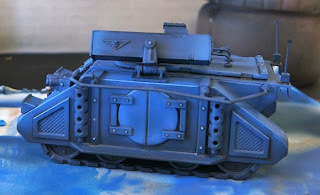 Warriors have a wide stance, which makes them fit poorly on normal GW bases, so I may gin up some resin bases for them. My last completely unpainted models are 4 bases of scarabs. I'm glad the end is in sight. I love the new Necron models, but there just isn't enough variety to keep and hold my interest. I find myself itching to paint some good old power armor. I wish everyone a happy new year, and oh yeah..world peace.